Most people visiting San Diego tend to stay in the actual city of San Diego and neglect its suburbs, but you won’t want to miss everything North County has to offer! You’ll find fabulous restaurants, beautiful beaches, trendy cocktail bars, and historic movie theaters, which are just a few of the things that this city is known for. In recent years, places like Del Mar, Encinitas, and Oceanside have become something of a mecca for foodies, art aficionados, and event lovers alike! Here are 15 fun things to do in North County. White rhinos, Sumatran tigers, and California condors are among the 3,500 residents at the renowned San Diego Zoo Safari Park, a 1,800-acre extension of the famous San Diego Zoo. Most of the animals live in free-range enclosures, enabling them to interact as they would in the wild. In addition to exhibits like the Lion Camp, this expansive park also has a petting corral and a walk-through aviary where visitors can feed lorikeets by hand. Special activities range from tram rides and zipline tours to animal shows like the Cheetah Run, which provides an up-close view of a cheetah sprinting at full speed – something the little ones will definitely love! For the lego lovers in your life, LEGOLAND California is the place to be. A celebration of the famous childhood toy, LEGOLAND California was the first amusement park of its kind to open and the first in the United States. The park, geared toward younger children between the ages of two and twelve, features over 60 rides, shows, and attractions, including a LEGO factory tour! 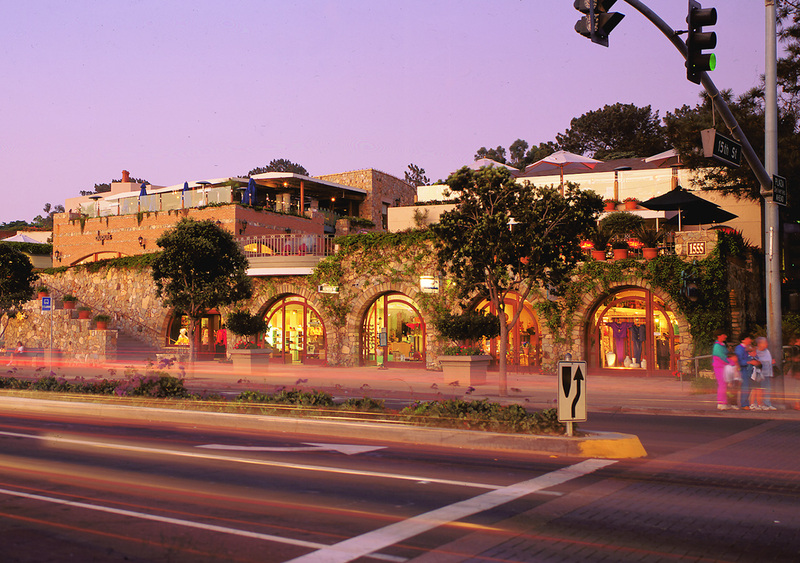 The revitalized oceanfront Plaza in Del Mar offers 50 upscale restaurants and boutique shops to explore, including the Frustrated Cowboy for western gear and Ooh La La for crystal-embellished blouses, lace-and-ruffle tops, and wildly striped sundresses. Several great restaurants, including Il Fornaio Del Mar, Rendezvous, and Pacifica Del Mar, all make for a lovely evening meal after a long day of shopping! 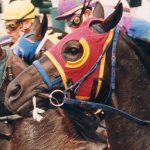 Check out other fun activities to do in Del Mar here! Where else can you find an entire museum dedicated to the history of surfing?! Only at the Carlsbad Surf Museum in Oceanside, California. You’ll see wooden surfboards from the 1900s to today’s foam and fiberglass boards. The permanent exhibit includes the surfboard and swimsuit pro surfer Bethany Hamilton was riding and wearing when she was attacked by a shark and lost her left arm. The California Surf Museum is open daily from 10 a.m. to 4 p.m. and until 8 p.m. on Thursday. Kids under 12 get in free; adults pay $5. Admission is free on Tuesday. Imagine a sculpture garden of mythical creature totem poles covered in thousands of pieces of hand-cut colored and mirrored glass and ceramic and stone mosaic tiles encircling a queen standing on top of a giant eagle. That’s what you’ll get at Queen Califia’s Magical Circle! Like wandering through a surrealist dream, the entrance of the sculpture garden is guarded by a wall topped with two mosaic serpents. Before you can reach the center of the garden you must navigate a 3-foot maze made from black and white tiles. Having reached the center, your quest is rewarded with the discovery of Queen Califia’s Magic Circle. 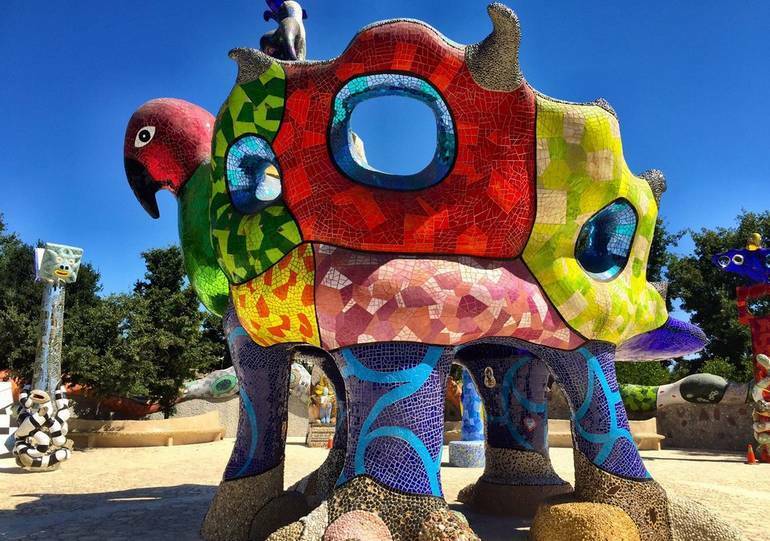 Queen Califia’s Magical Circle is the only American sculpture garden created by French artist Niki De Saint Phalle. You’ll find this unique place in the Iris Sankey Arboretum in Kit Carson Park, Escondido, California. Escondido gets hot and the tiles conduct heat, so take care when visiting on a hot day. Admission is free, but check their website before you go as they are only open during certain weekends of the month. Ask around, and you’ll discover that Encinitas has some of SoCal’s finest beaches. Each beach has its own personality, but we love Swami’s Tide Pools. Here you can catch sea-life in an up close and personal way in the fall. Now’s the perfect time to plan a trip to Swami’s Tide Pools. If you walk the rocky area at low tide you may see Hermit crabs, sea hares, sea cucumbers, sea urchins, brittle sea stars and maybe even an octopus or two! 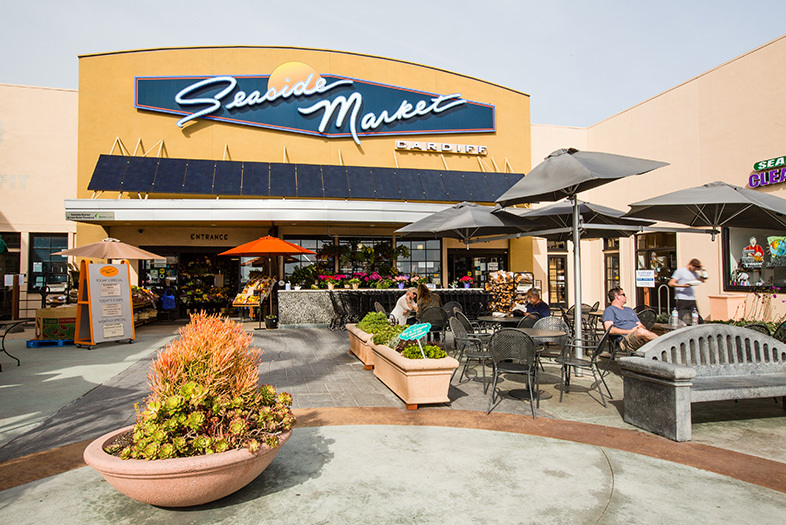 Head over to Cardiff Seaside Market for some early morning goodies – and to stock up on fresh produce and the famous Cardiff Crack (which is slang for a yummy seasoned USDA Choice tri-tip that is trimmed, marinated, and infused with their specialty Burgundy Pepper Marinade). It’s called the ‘Cardiff Crack’ because customers find it addictive! Not to worry, you don’t have to stick to beef: the scallops and seafood here are restaurant quality, as well as the dozens of spots to pick up some fresh produce and vegetables. The best way to experience the Seaside Market? Enjoy a leisurely stroll and take your time exploring by the water! If you’re looking for a place to relax body, mind, and soul, you’ve come to the right place. Walk the gardens built and maintained by the Self-Realization Fellowship and achieve peace of mind (for an hour anyway). The beautifully landscaped gardens boast views of the Pacific Ocean and are dotted with benches and other sitting places for quiet reflection or simply a place to relax. 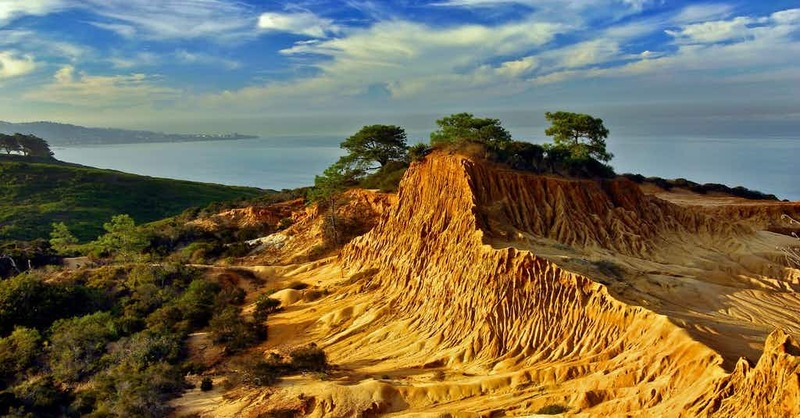 Perched atop sandstone bluffs overlooking the ocean, Torrey Pines State Reserve offers sweeping views of the Pacific and another stunning natural landscape. The striking Torrey Pines trees and winding hiking trails combine to make this spot one of the most tranquil in the area. Pick a hiking trail, and meander through the wind-sculpted trees, twisting canyons, knobby cliffs, and bird-filled estuaries. Steps carved into the hillside take you down to the beach should you wish or you can commune with the birds and enjoy your 360-degree ocean view. This is a gorgeous place filled to the brim with serenity. At 1,942 feet, the historical Oceanside Pier is one of the longest wooden piers on the West Coast and a fantastic tourist attraction! Take a leisurely stroll out over the Pacific Ocean, watch the surfers ride a wave, fishermen catch a fish, or grab a bite to eat at the famous Ruby’s Diner located at the end of the pier. At the entrance of the Pier is the Amphitheater, which hosts many musical and cultural performances. The pier is the backdrop for some great Oceanside events, which include concerts, surf competitions, Iron Man, Fishing Derby, Classic Car Shows, and it’s within easy walking distance to the Farmer’s Market and Sunset Market. Don’t forget to look for some wildlife! The Pier is a great place to spot seagulls, pelicans, dolphins, seals, stingrays, fish, and much more. 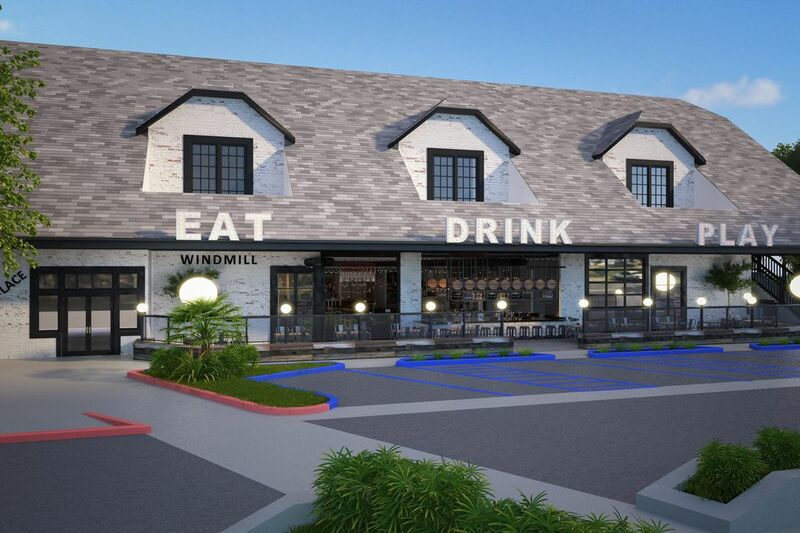 The first food hall in North County is definitely a sight worth seeing. Housed in the iconic former Pea Soup Andersen building just off the I-5, the 12,000-square-foot space, with a design inspired by the 1930s and 1940s, features plenty of indoor and outdoor seating, a full bar, and interactive games. You’ll find something to eat for the whole family, with dozens of eateries including Bing Haus, Bread and Cheese, Lobster West, Thai-Style Kitchen, and more. The food hall is brand new as of fall 2018, and is a fun place to walk around for the day. Don’t forget to visit their 60-seat Chicago-style speakeasy bar, which occupies the entire second floor! North County arguably has some of the best restaurants in San Diego, with a full range of cuisines and fare ranging from casual to ultra-chic. Some beloved local spots have been there for years – Solace & The Moonlight Lounge, Wrench & Rodent, and Flying Pub Pub + Kitchen – and some are brand new, including the second outpost of The Crack Shack, Campfire, and Park 101. You’re sure to find something everyone will love! North County dining hotspots include Encinitas, Carlsbad, Del Mar, and Oceanside. The Carlsbad Lagoon is a great place to spend the day, especially during the warmer months. Filled with many water sports options, the lagoon has something for everyone. Motorized rentals include Yamaha WaveRunners, boat rentals, and Wakeboarding and Waterskiing (includes a boat with driver). If you want a little slower speed the lagoon rents kayaks, stand up paddle boards, canoes, paddle boats, and aqua cycles. The Lagoon has its own private beach and rents out private party areas for large groups. While it may seem counterintuitive, there are actually several great spots for beachside camping in North County! 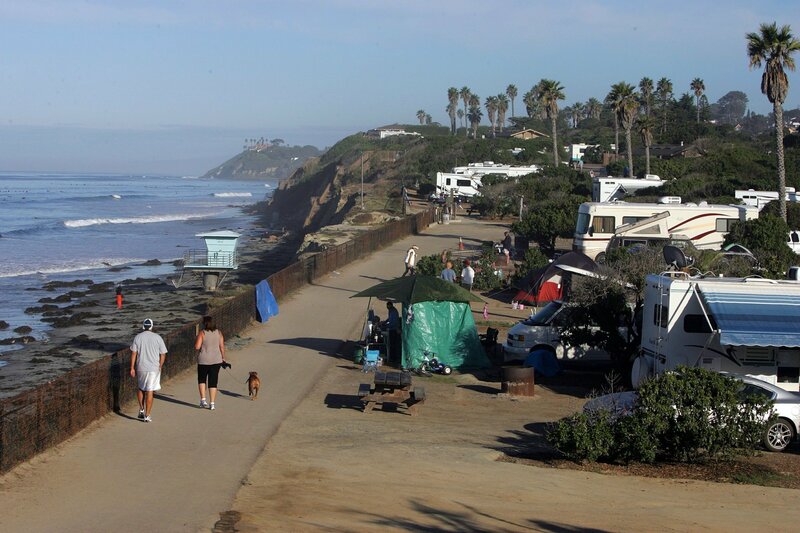 San Elijo State Beach is one of the most popular campgrounds in Southern California. The campgrounds are hard to reserve during the summer months, but if you’re a local, there is plenty of space in the off-season. Camping is a great way to sleep by the beach, and walk to the waves for an early morning surf. Just up the road, South Carlsbad State Beach features RV sites with hookups, a dump station, camp store, restrooms, and showers. Inland sites are $35/night and premium campsites are $50/night. The Belly Up is a fun live music venue in the Cedros Design District (Solana Beach). The venue promotes all different genres of music including hip-hop, rock, alternative, reggae, R&B, and more. The venue even has cover bands and a weekly Friday Happy Hour to get the weekend started! Belly Up is 21+, and has a full bar and menu to order from. 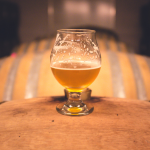 If you’re in the area early, check out Culture Brewing Company a few doors down; it’s one of North County’s best breweries and a fun spot to grab a quick beer with friends before a night on the town. Whatever your plans may be, North County, San Diego is a fun spot to spend the day with friends and family. Visit our blogs for more fun things to do in Encinitas and Del Mar!